Shea Krause is confident she and about 50 other members of Pitt’s Jumpstart chapter had the Brightwood Civic Group’s Pumpkinfest under control Saturday morning. “If anything, there were maybe too many people. I don’t think there were enough jobs,” she said. Krause and her peers helped make and sell food, gave kids airbrush tattoos and helped them pick out and paint pumpkins as part of the University’s 10th annual Pitt Make A Difference Day. Organized by the Students for Civic Engagement Council and the Office of PittServes, thousands of Pitt staff, faculty, alumni and students went out into the Pittsburgh region and beyond to work on service projects for a few hours. “I think that any service is helpful, regardless of whether it’s one day or prolonged,” Krause, a junior psychology major, said. The 2017 PMADD drew more than 4,000 people from Pitt’s main and branch campuses to 99 sites — including ones in Las Vegas and Washington, D.C., which were staffed by alumni. Students, staff and faculty at Pitt’s main and regional campuses boarded buses around 9 a.m. that took them to the sites they would be volunteering at, staying until around 2 p.m.
Pitt’s first PMADD was held in 2008, according to Shawn Ahearn, director of communications for the Division of Student Affairs. 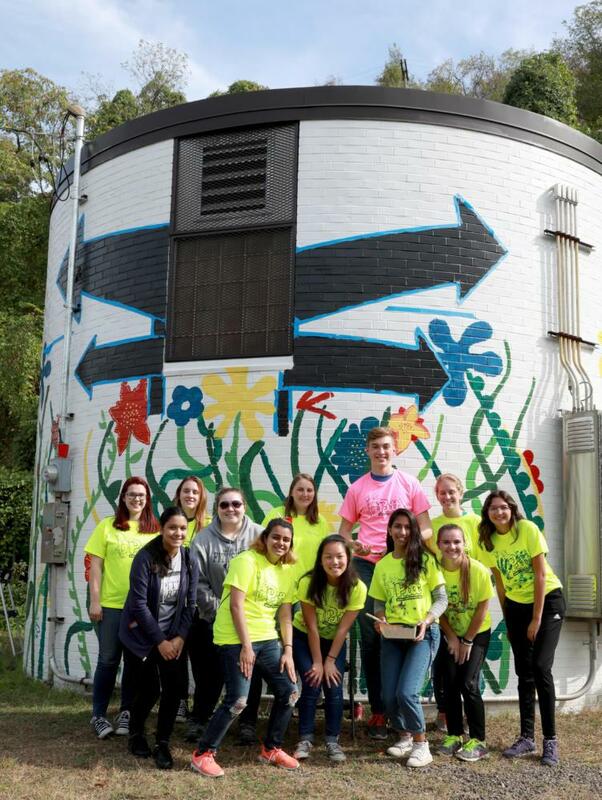 More than 1,100 resident students volunteered at 42 sites across the city. The idea for the day came from the Student Government Board after it learned about Make A Difference Day — an organization that orchestrates a nationwide day of service each year— and wanted to create something for Pitt specifically. “The goal basically was to get first-year students involved and connected to the community and to each other,” Ahearn said. After the service day became more popular, PittServes began sending out surveys for student feedback. In 2012, 96 percent of 2,556 PMADD attendees reported that they planned to continue volunteering, Ahearn said. In 2013, 70 percent of the 3,037 participants said they felt more concerned about the needs of others after finishing their projects. In 2015, 84 percent of the 3,274 surveyed said they felt they had made a difference in the lives of others. In 2016, 97.5 percent of 3,850 survey respondents said they would continue participating in community service following PMADD. According to Misti McKeehan, director of PittServes, another survey asking similar questions has been sent out to students who signed up for PMADD 2017. Five students who complete the survey will be awarded a prize in honor of PMADD’s 10th anniversary. Another five have already been awarded prizes such as a Pitt T-shirt, blanket and a Pitt Athletics gift bag for their participation in the event. McKeehan attributed PMADD’s decade-long popularity to the University’s strong commitment to investing in outside communities. “This started as a strong focus for first-year students. We haven’t lost them, but we’re now engaging at all levels of the University. This shows that the University is really committed to service,” she said. McKeehan said this was also a special year for PMADD because the University had been awarded $10,000 from Make A Difference Day for their work during PMADD 2016. The cash was used to fund three special large projects this year — Brighton Heights requested help turning an abandoned building into a community center, Beechview wanted compost bins built and Millvale needed assistance in creating a natural play space. “We wanted to invest it back into the community because the community has been so good to us for nine years,” she said. The PittServes and SCEC put out a request for proposal over the summer and received about 15-20 applicants for the grant before deciding on the three projects. They based their decision on the impact helping these neighborhoods would have on the community. “That’s a big focus for PMADD moving forward, that community members are not only saying ‘yeah, sure we can have a group of students come,’ but that we’re doing projects that are meaningful and long-term for the communities we work in,” McKeehan said. Alexandra Rich, a junior psychology major, served as co-chair of PMADD this year. After being selected for the position in April, she began the months of planning and organizing with the other co-chair, senior Nisha Nanavaty. This year’s PMADD committee improved the event by placing a larger focus on student organizations, Rich said, sending out a service interest form and assigning them projects that matched. For instance, Alpha Delta Pi made activity books for the Ronald McDonald House and Kappa Kappa Gamma made books for the Children’s Museum. “When people were coming back from projects, I was asking student leaders how they went, and those in the student orgs just felt like this experience of PMADD this year was better than in the past, their projects were more meaningful, they really fit their interests,” she said. McKeehan cited several student groups that have formed relationships with certain community groups they volunteered with through PMADD. The acapella group C Flat Run visited a veteran and military senior care facility and have already made plans to visit in the next couple months. McKeehan said community partner feedback on PMADD is always positive, with partners saying the students’ work made a great impact. “We hear that the work that the students accomplish in a few short hours on a Saturday is something that would take weeks, if not months for our partners do so themselves without the person power of PMADD,” McKeehan said. Rich said sending thousands of students into the community to give some of their time back to people who work hard each day to provide resources and support to others is a big opportunity, and seeing the plans she makes with SCEC come to life is a rewarding experience. “I mean, we’re not going to change the world with one day, but we can provide that relief for our community partners, even on the smallest level,” she said.